Elvis and Ireland is the “Irish Biography” of Elvis Presley. It is the detailed story of Elvis Presley’s life and career, combined with a timeline of events in Irish popular culture and the social changes brought on by his unique brand of rock ‘n’ roll. Buy the Book! Ireland including anecdotes, entertaining trivia on Elvis’s connection with Ireland, his Irish chart successes, as well as areas of censorship. the Dáil (Irish Government) to the pulpit. Elvis and Ireland focuses on how Irish artists used Elvis and American popular culture for their own artistic efforts, from Ireland’s earliest showbands and beat-groups to the rock legends Rory Gallagher, Phil Lynott and Bono. It covers several decades of Irish popular music without ever losing track of Elvis’s story. In brief this book is a view of Elvis Presley through Irish eyes. Elvis and Ireland brings together the story of the global superstar from his birth to his untimely death, picking up the Irish connections along the way. To add a further Irish dimension, the book also features artwork of Elvis by three famous Irish artists. Hundreds of Elvis books already exist but rarely does a new Elvis book have something to say from a totally different cultural stand point. All music fans, and not just the Irish ones, will find this an exhilarating journey through the career of the universal music icon. 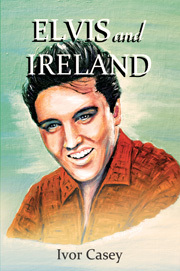 Elvis and Ireland is authored by Ivor Casey, born and raised in Co. Dublin. He has a BA (Hons) Degree in English, Media and Cultural Studies and has been a freelance journalist throughout Ireland for the past 10 years. Ivor is 29 years old, making him possibly to date the only Elvis biographer to be born after Elvis died.